The Android applications that I've been working on. KenSquared is my first Android application. Similar in gameplay to the popular game Sudoku, KenKen is a puzzle game that involves strategic placing of numbers in a square. 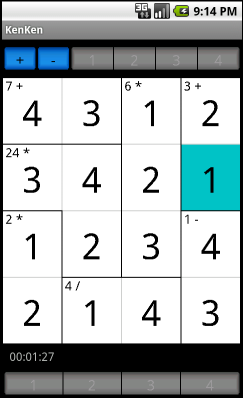 The unique aspect of KenKen is the constraints on placing numbers. The game board is divided into regions of squares called cages. For each cage, a number and a mathematical operator are shown and the numbers that you place in that square must, with the given operator, yield the number in the cage. Like Sudoku, a number must appear only once in a given row or column, but can be present more than once inside a given cage.